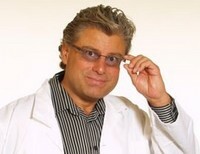 Dr. Landa dedicated to phytotherapy research and herbal remedies for 20 years. In 2008 won the World Integrated Medicine Congress a gold medal for "Best Dental Product" in the field of holistic medicine. He was born in Klatovy in 1955. He graduated from the Faculty of General Medicine of the Charles University in Prague. Having terminated his medical practice in 1997, he has concentrated solely on studying phytotherapy as well as on the research and development of herbal preparations. Since the 1980s, MUDr. Landa has been engaged in studying herbs and their effects. Twenty years ago, he started performing his own researches into herbal preparations in order to use them for the treatment of gum inflammation. In 1993 he discovered his own technology of extracting effective substances from herbs and finished the preparation of a unique combination of substances with effects against gum inflammation and parodontosis. During the years 1993-2003 he was researching and adapting his treatment method on a selected sample of patients. Having assessed the results of the demanding testing stage as successful, MUDr. Landa built a small specialized team of co-workers, whose task was to provide for the commercial release of the preparation into the market. Dr. Landa’s team released the new herbal mouthwash into the market in 2004. Patients and stomatologists were gradually becoming aware of the Dr. Landa’s Mouthwash. Until 2008, the sales and distribution of the Dr. Landa’s Mouthwash was limited to a selected network of dental practices and business partners. In 2008 we managed to increase the production capacity of our plants, which enables us to meet the ever increasing demand. At the same time, the research and development of other effective herbal preparations continues. In the first place, we are enlarging our dental care and oral hygiene product portfolio. In the second place, we are developing herbal extracts against chronic urinary tract inflammations and intestinal inflammations. By this day, we have had several thousands of satisfied clients, who have managed to get rid of their troubles by using the Dr. Landa’s herbal preparations.